WASHINGTON – A nominee for the Federal Energy Regulatory Commission on Thursday sidestepped Senate Democrats’ request to recuse himself from voting on energy pricing policies he helped draft as a senior Energy Department official. FERC nominee, Bernard McNamee is a senior Energy Department official who previously represented electric and natural gas utilities in Virginia. Democrats on the Senate Energy and National Resources Committee were concerned of his support for the Trump administration’s policies to provide subsidies for coal and nuclear plants. In January, the FERC rejected the Grid Resiliency Pricing Proposal that McNamee co-wrote. Critics said the pricing plan would have favored the nuclear power and coal industries. Sen. Tina Smith of Minnesota asked McNamee about renewables as a viable energy option. Sens. Ron Wyden of Oregon, Catherine Cortez Masto of Nevada and Angus King of Maine asked McNamee repeatedly to recuse himself from matters relating to the Grid Resiliency Pricing Proposal. In response, McNamee said he would talk about it with FERC’s ethics lawyer. “Vote no on McNamee,” he said as police escorted him out of the room. The committee also considered the nominations of Rita Baranwal to be assistant secretary for nuclear energy at the Energy Department and Raymond David Vela to be National Park Service director. If confirmed, Vela would be the first Latino to head the National Park Service Director in its 102-year history. Wyden demanded specific changes Vela would make before he would vote to recommend his confirmation. With 20 years in the industry, Baranwal said one of her priorities would be to make the next generation of nuclear energy more financially feasible. Baranwal also said that the voices of communities are important to consider but final decisions rest with federal officials. 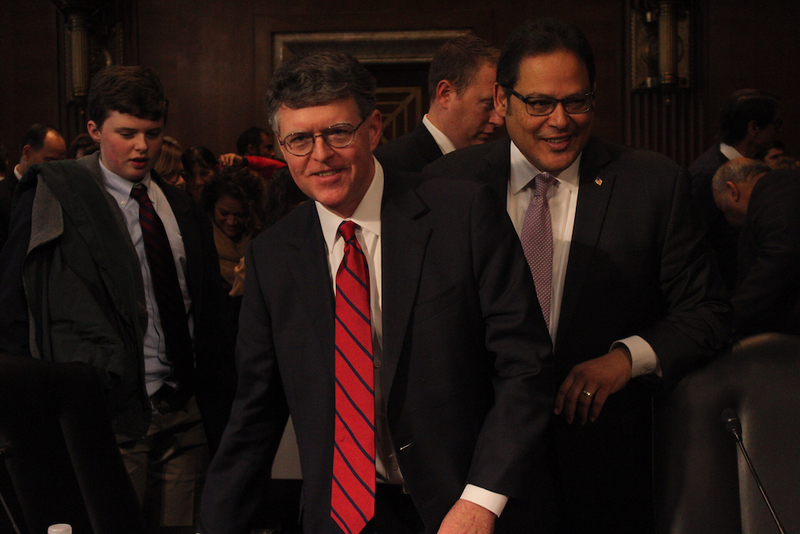 Committee members left with mixed feelings about McNamee but most seemed to support Baranwal and Vela. The next step is for the committee to vote on whether to recommend each candidate for a confirmation vote by the full Senate. No date has been set.